First I saw Fidel and his friends dancing to bless the land. To start the dance, they blew into a shell and made a fire in a bowl. The dancers have a lot of things to put on, like white robes with sashes… I have seen clothes like that in Mexico. Next I helped plant some seeds. It’s a lot of work. At the greenhouse, my friend Andrew showed me how to harvest the lettuce. I helped by picking a lot of leaves. There were about 800 million plants in there. It was the most fun thing I ever did. The next day I helped him load the salad on a truck so he can drive it to the school. It was heavy and cold. Now when I eat salad at school I remember all the people and the work that goes into making it, and it tasted really good too. How did a handful of Quakers’ concern about militarism grow into this program that now provides fresh organic produce to more than half of New Mexico’s school children? Through the story run strands of deep listening, respect for native spirituality, and a vision of an economy and a land that nurtures the community’s well-being. It started in the early 1970s, when Quakers from New Mexico approached the American Friends Service Committee (AFSC) headquarters in Philadelphia to explore the possibility of developing a program in northern New Mexico. A leading concern was militarization and the military economy connected to air force bases and weapons laboratories, including Los Alamos and Sandia National Laboratories where the atomic bomb was designed and manufactured. New Mexico had been annexed to the United States following the war with Mexico less than a century before the Second World War, and Friends were seeking a means by which to counter a social order based on organized violence. Following its normal practice, the AFSC sent out a small team to consult widely with Friends and members of local communities in the northern Rio Grande region of the state. Over and over again, they heard concern from the community, not about militarism, but about land and water rights. The result of these listening sessions was a decision to set up a program in support of traditional communities, whose titles to land, water, and common natural resources had been expropriated by the federal government and unscrupulous private interests. The people of these communities, largely Hispanic and Native, had lost access to the resource base that had enabled them to preserve their culture and lifeways; many had been reduced to finding occupations in the armed forces, representing the political authority that had taken their land. The AFSC recognized that, while there were other organizations resisting militarism in the area, the more pressing need to which they could respond was for economic alternatives to military employment, and that success in this area required a greater capacity to regain lost land and water rights. The pueblos of this area have a water system that dates back to before the Spanish arrived in 1540, built around communally-managed irrigation ditches called acequias. The Spanish settlers brought additional irrigation technology developed in North Africa with them to New Mexico, and the two approaches combined to form the regional systems that have provided water to agricultural communities for the last 400 years. Both Pueblo communities and Spanish colonial settlements had access to land and natural resources confirmed by the Spanish Crown and the Republic of Mexico, an arrangement which was challenged by the United States’ annexation of northern New Mexico following the defeat of Mexico in 1848. With water becoming an ever more valuable and contested resource, defending this traditional shared system was pivotal in protecting traditional water rights. The AFSC heard the underlying spiritual principle, that the water belongs to the earth and the earth belongs to God, and they followed the community’s lead. 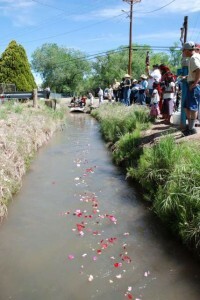 In 2002, after working for twenty-five years to protect land grant communities and empower regional acequia associations to advocate for historic water rights, the AFSC program in New Mexico turned its attention toward the land. How might traditional land use systems and values best be supported in the 21st century? The text above was just an excerpt. 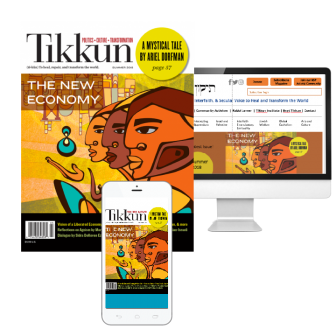 The web versions of our print articles are now hosted by Duke University Press, Tikkun’s publisher. Click here to read an HTML version of the article or to download the PDF version. Pamela Haines, a longtime resident of Philadelphia, is active in peace, justice, and environmental work among Quakers. She has written a Pendle Hill pamphlet, Waging Peace: Discipline and Practice, led a variety of workshops on faith and economics, and spoken on the topic of climate, justice, and racism. Her paid work includes capacity building among childcare workers, teaching peer counseling, and leading family play groups. She is on the board of the Mill Creek Urban Farm in West Philadelphia, is active in her community garden, and enjoys deep personal connections in Poland and Uganda. She is passionate about quilting and repair of all kinds and blogs at www.pamelalivinginthisworld.blogspot.com. Mt. Shasta, a small northern California town of 3,500 residents nestled in the foothills of magnificent Mount Shasta, is taking on corporate power through an unusual process — democracy. Consider the latest toxic spill in Hungary. To put it in terms that anyone can grasp, it is as though we filled up the entire Empire State Building with some of the worst stuff imaginable, tipped the building completely on its side, and then spilled the full contents on the ground. The resulting mess would have filled an area of approximately seventeen square blocks, or slightly over a half-mile in any direction. We know the earth is beautiful. We equate the livingness of it with beauty. When we mourn the loss of life, we also know that we mourn the loss of beauty. And we look to beauty as a marker of life, even life that has been badly mutilated.